After being given tickets for a three month voyage around the Pacific on the container ship Konstellation. by her grandmother, Jana takes her friend, Kelsie McNeil with her. On board they meet the other passengers, artist Rowan Clardy and an elderly couple, Hank and Denise Thorpe. After a few days, the Konstellation is attacked by pirates who strip the ship of all its communication and electronic equipment. The five passengers manage to hide in an empty container and escape being caught. They later discover they are alone on the ship. After a frightening time when they disarm bombs placed by the terrorists the five realise they have though no way to control the ship. The engine is still going but all communications and navigation gear is destroyed. The Konstellation hits a coral reef and begins to sink. The five passengers manage to land on a coral atoll where their adventures really begin. Darkness had just dropped over the island when a puffing Kelsie burst into the cabin. Her knees were bleeding and dirt covered her limbs. Everyone except Hank, who had been with Kelsie, glanced up. Denise paled and almost dropped the basin of water she was carrying. Jana glanced at Rowan but kept a straight face. They both knew why Kelsie and Hank were in the building and it wasn’t to just watch the sunset. 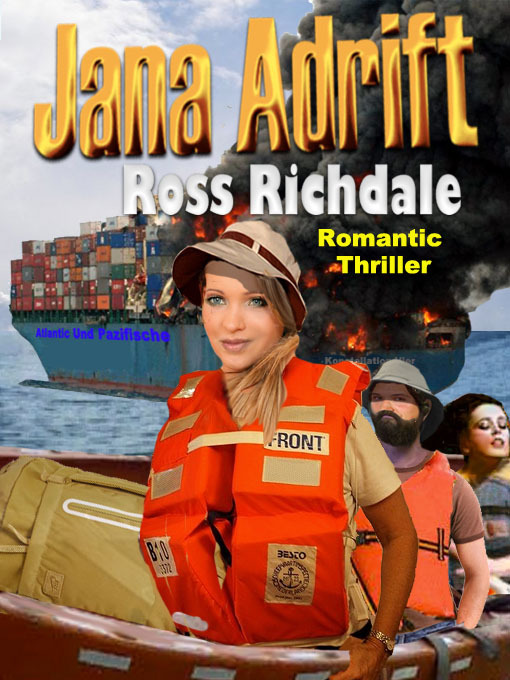 Within seconds, Rowan had found the flares while Jana picked up their two flashlights. The four tore out and met Hank coming in the opposite direction. He also looked excited. Their flashlight beam bounced off rocks and trees as they ran. Rowan grabbed Jana’s hand so they could support each other over the uneven surface. Soon the sound of breakers ahead filled their senses and a moment later they saw the line of white surf against the purple sky. Stars had not yet begun to twinkle. Then they saw orange light flickering on their left. Rowan stopped and held took a flare out of the container. “Ready?” he whispered. He sat it in the ground and pulled the tab. They stepped back and waited. There was a hiss rather than a report and the red flare arched across the sky. It burst onto a shower of light and lit the area up like a red morning. “Come on,” Rowan yelled and again grabbed Jana’s hand. “Oh my God,” Rowan cried and swept Jana into his arms. He kissed her and they watched the boat until the flare light faded. A small flare burst up from the boat. The others arrived and stood with their arms around each other just staring out to sea long after both flares died. “Will they come in?” Kelsie screamed. “Its not that warship that took the terrorists off the Konstellation is it, dear?” Denise said. A blue flare flew up from the boat. Rowan touched Hank’s arm. “Is there any significance in the colour?” he asked. This one also lit up the whole sky for a few moments and Jana could see the ship. It certainly looked like an ocean fishing boat with high masts and a small spinning radar screen above the bridge, She tried to read the writing on its bow but their flare faded and they were plunged back into darkness. It took half an hour to get back to the lagoon and along the beach to the entrance. The undergrowth petered out at the coral at the end of the island, which was now mere meters wide. Out beyond the breakers the lights of the boat showed in the darkness. It appeared to be anchored. “I’ll fire another flare,” Rowan said. Again the heavens were lit up for several moments and again there was a blue flare fired in reply. “We need to pack everything up, too,” Denise added. Rowan and Jana held hands and watched their friends disappear until only their flashlight bobbing along the beach was visible. Later a faint flicker showed in the cabin windows. “Hank’s lit the lamp,” Jana said. She turned. The boat was still there, a line of portholes and square bridge lights, rising and falling in the swell. The pair sat with their arms around each other. The stars came out above and later a crescent moon poked over the horizon. One by one the lights in the boat went out until only the square cabin lights and the navigation lights showed. Jana leaned against Rowan. He tucked his arm around her and squeezed her tight. They lapsed into silence until Jana felt her eyelids grow heavy and she fell asleep. She woke several times during the night and it seemed morning would never arrive. Finally, she awoke to see the sky was red and the boat still there bobbing in a slight swell. The sound of footsteps made her glance back along the beach. Hank was approaching. “She’s one great lady,” Rowan said and fixed Hank with a stare. “We did,” Rowan said in a whisper. They watched boat turn and head in. Someone aboard returned Jana’s wave. Five minutes later it was through the heads and chugging by them. It looked quite crisp and clean with a gray hull and dull red line along the hull. “Korean characters,” Rowan said when he saw the writing on the superstructure. “Not only that but look at the flag at the stern.” Hank sounded serious. Jana studied the flag waving in the breeze. It showed two narrow blue strips between a wide red interior stripe. In the centre, a white circle enclosed a red star. Jana’s heart dropped. “Oh hell,” she whispered. Jana waited by the jetty with the others as the North Korean fishing boat circled into the lagoon and stopped twenty meters off shore. She heard a whistle and a splash as the anchor fell into the water. The boat was similar in size to one of the Coast Guard coastal patrol boats back in Houston but showed no sign of any military equipment. The orange and white bridge and superstructure were in the centre behind a streamlined bow. Four cranes stuck up like poles along the boat. Gear covered nearly all the deck space but the deck had a sense of order and neatness. As well as being painted on the bow, the number 436 was painted under the Korean characters across the stern. A half a dozen crew members rushed around the deck and a small motorboat was lowered to the water. Three men climbed into it and another descended a ladder from the bridge deck and went aboard. Jana saw the others nod and, though not really convinced by Hank’s arguments, decided it was expedient to go along with them. The second suggestion was probably sensible. Kelsie clutched Spook and stood biting on her bottom lip. “Didn’t they capture some South Koreans twenty years ago and only just release them?” she whispered. Two sailors raised a new flag on a previously unnoticed pole. This unravelled in the wind to show a union jack in the top left corner and four red stars in a diamond shape against a dark blue background. “Oh hell, what’s that?” Kelsie muttered. “Yeah, I’ve been Canadian for fifteen minutes,” Kelsie said. “Well we look like castaways, don’t we?” Kelsie whispered. Jana looked around and nodded. Everyone was deeply tanned with somewhat unkempt hair while both men had scraggy beards. Their shorts were bleached and tatty while their shirts, usually unworn, were clean but wrinkled. Rowan wore an old straw hat and Hank his inevitable baseball cap. Denise wore a frayed sun hat, the shorts originally borrowed from herself and the floral blouse was so faded the flowers had lost their colour. Kelsie had her hair tied back in a ponytail and a line of lace poked out the bottom of her unhemmed shorts. Her blouse was knotted around her tummy so a tanned waste and tummy button showed. Except for Denise they had all lost weight. In contrast, Denise looked heavier and healthier than the frail woman Jana had first met. Jana grinned and did up three buttons in her own blouse. Rowan stepped along the jetty now fitted with the new deck they had methodically built and reached out for a rope one sailor tossed to him. The man at the stern rose and hooked a small ladder to the jetty and climbed up. He was short with oriental features and dressed in waterproof coveralls and a flat blue cap. He stood up straight glanced at them all, saluted then bowed his head politely in oriental fashion. The captain, as they later found the man to be, shook Rowan’s hand and made a brave attempt at repeating his name. “Yong Ko,” he said and added another sentence in his native language. Rowan did an excellent job of introducing Denise first, followed by Kelsie, Jana and finally Hank. Yong Ko clasped their extended hands with both of his and bowed his head with each introduction. At the end he introduced his crew and Jana noticed that one was a woman about her own age. Her name was Ha Min. All bowed but stared at the ground, not at her face when she was introduced. Yong Ko even patted Spook and said something in a soft voice before he waved his hand out towards the cabin. He looked back at Rowan and spoke rapidly. “Do you speak English?” Rowan asked. The captain frowned and nodded. “That means no,” Hank said, turned to the newcomer and spoke in another language but the Korean still just nodded. “So we use symbols,” Rowan said. He escorted the four Koreans off the jetty and found a long twig. He drew a wonderful sketch of a sinking yacht in the sand then a sun and a moon. Afterwards he wrote 30. Hank took Rowan’s stick and pointed to the flags flying on the boat then drew a New Zealand one in the sand. He pointed to his sketch then at each of them in turn. The captain looked perplexed but the woman stepped forward, jabbered away and flung her arms around as if in explanation. Yong Ko smiled for the first time and bowed again from the waist. Denise came to the fore and soon had a coconut and pawpaw stew steaming on the cooker. Hank produced a wine he’d made from fermented coconut milk. To Jana it was a vile tasting drink but the Koreans sipped it politely and smiled in approval. After the meal the captain spoke to one of his crewmen who disappeared and returned moments later with a large book with North Korean flag embossed in a navy blue cover. After Denise took the dishes away and wiped the table, the captain placed the book on the table and opened it. It was all in Korean characters but easily recognizable. Yong Ko found a double page spread of the central Pacific and pointed to a tiny dot midway between the equator and tropic of Capricorn. “This island?” Rowan said and pointed to the ground. The captain sort of smiled and traced his finger from the island southwest. The captain waved his hand and turned back a page. There he pointed to North Korea and traced his finger across the ocean. He turned to the original page and traced his finger to their island then on down the page to New Zealand. The captain turned to the front of the book where pictures of fishing boats and fish filled the page. He pointed to a photo of fishermen hauling in a net of fish then flipped on to a large map of New Zealand. He glanced up, spoke again and drew a circle with his finger around New Zealand then pointed to the ocean to the left. “They’re going to fish in the ocean around New Zealand,” Kelsie said. The Koreans, though, still appeared polite and amiable. They waited while the discussion was going on then stood and walked out into the sunshine. Everyone followed and the dialogue continued until Yong Ko held his fingers up four times and pointed to his watch. “He means twenty minutes,” Denise said. “I vote we go,” Jana said. “There are risks,” Hank added doubtfully. He walked inside and returned with Denise. Again it was Min who realized what was being said and spoke to her captain. He glanced at Rowan who smiled and nodded. Once the castaway’s intentions were clear it was all go. Another lifeboat came ashore and six more crewmembers jumped out and began to load everything handed to them. Min ran down to the second boat and returned to Kelsie. She had a large wire cage in her hand, pointed to Spook that Kelsie still cuddled in her arms. “Spook?” Min repeated in a high-pitched voice. Kelsie laughed, nodded and placed Spook in the cage. The cat protested and glared at her when the lid was lowered. However when Kelsie picked the cage up and stayed with her she sat down and appeared contented. Fifteen minutes later they climbed aboard the fishing boat and Min escorted them to a small cabin that held six bunks, three above each other on each side of a tiny walkway. Their luggage was already stacked neatly above and on a small attached table at the far end under a small porthole. Jana walked forward and glanced out. She could see the jetty; the cabin, sand and a lonely wooden cross near the coconut palms.